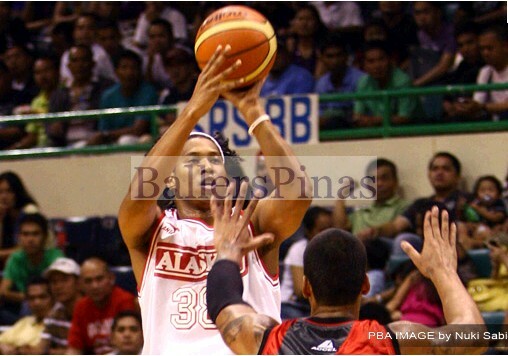 The second leading scorer of Alaska, Joe Devance is now going around the PBA seeking his final home. After leaving Alaska because of a trade involving him and JR Reyes, Joe Devance is again leaving the Air 21 home as he will be going to the B-Meg Derby Ace along with Marcy Arellano in exchange for KG Canaleta and Jondan Salvador. B-Meg, an SMC team will again have a new scorer in Joe Devance. Devance is averaging 13.4 points and 8.3 rebounds per game. In fact he's an MVP candidate this year. The problem for B-Meg is, how they can get Devance going while James Yap, Kirby Raymundo and Peter June Simon are on the floor. Devance will not just let his MVP campaign go down the drain by accepting a reserve player's role of a 6th man role. He needs to get his minutes or else he may not be happy with B-Meg and he might ask for another trade. "PBA commissioner Atty. Chito Salud said he hasn't received any trade paper signed by both camps as of early Wednesday afternoon. He also refused to make a comment whether the trade can be approved or will need revision, just like what he did in previous transactions, to balance the deal between two teams." This new trade of Devance needs prior approval from the PBA Commissioner. If he sees any lapse or injustice in the details of the trade, it may not happen. Another SMC team, perhaps Ginebra might get Devance because they need a big man to replace Billy Mamaril. I'm sure that B-Meg will give way to Ginebra because they are sister teams. As you can see, Air 21 wants a tall scorer in KG Canaleta. JC Intal can score like KG and they almost have the same height. If Ginebra would ask for a trade, Intal for Devance, that may be possible. Let's just hope that all these teams can get the player that they need and not what they want. Ginebra needs someone as tall as Devance. That's the only thing I can say. Why would BMeg give way to Ginebra for the rights to acquire Devance when they had been plagued by injuries on the frontline last season. Bmeg would really push in signing up his services since Raymundo hasn't logged in a lot of minutes for the past two seasons and had enough of his injuries. So Bmeg only offered Salvador and Canaleta to pry him out of air21. If Bmeg doesn't add draft picks with on this trade, there's a fat chance that this will not be approved by com. Salud. Sa me thing can be said of Intal/JDV trade. JDV's value is too good for what JC is offering on the table. hndi fair kun intal to JDV ang layo ng ABILITIES nun dalawa hamak na mas MAGALING c JDV.. haha fit na sa BMEG c JDV haha go BMEG! ! ! sa tinatakbo ng ngaun ng b-meg, malaki ang tsansa makapasok sa quarter finals at kung papalarin baka finalist pa.